First-generation college graduate Stefani Aleman is thankful to donors for the scholarships that have made her University of Oregon education possible — and for creating a host of opportunities that are leading her to pursue a career in public health. “Because of the generosity of the university’s supporters, I was not restricted by lack of financial ability to fund my education,” Aleman, a 2016 graduate, said during last month’s investiture of UO President Michael H. Schill. Today the UO announced that supporters have officially lifted the institution’s campaign over the $1 billion halfway mark. For the fiscal year that ended June 30, the university received nearly $202 million in gifts and pledges, the second-highest annual total for the campaign and the third highest in UO history. Giving has topped $200 million for three of the last four years. Now that the campaign has surged beyond $1 billion, more young people like Aleman will build bright futures thanks to the generosity of UO alumni, friends, parents and members of the faculty and staff, Schill said. Nearly $250 million in student support that will translate into greater access, faster graduation rates and reduced college debt. That includes $27 million for PathwayOregon, increasing by 69 percent the number of Oregon freshmen admitted to the innovative student support program since its first year in 2008. The Allan Price Science Commons and Research Library, which opens this fall and creates a model social and academic hub for the UO’s growing community of science students and faculty. A lead gift for the future Tykeson Hall, which has launched planning to better prepare students, especially in humanities, to match their talents and interests to careers. Support for student-athletes, including the new Jane O. Sanders Stadium for women’s softball, football’s Hatfield-Dowlin Complex, scholarships, Women in Flight and resources to provide an exceptional student-athlete experience. Major gifts to expand research excellence in genomics, obesity prevention, human physiology and volcanology, which are helping accelerate work to improve human and environmental health and safety. A first-of-its-kind gift providing international opportunities in education and global health between the UO and Saudi Arabia. 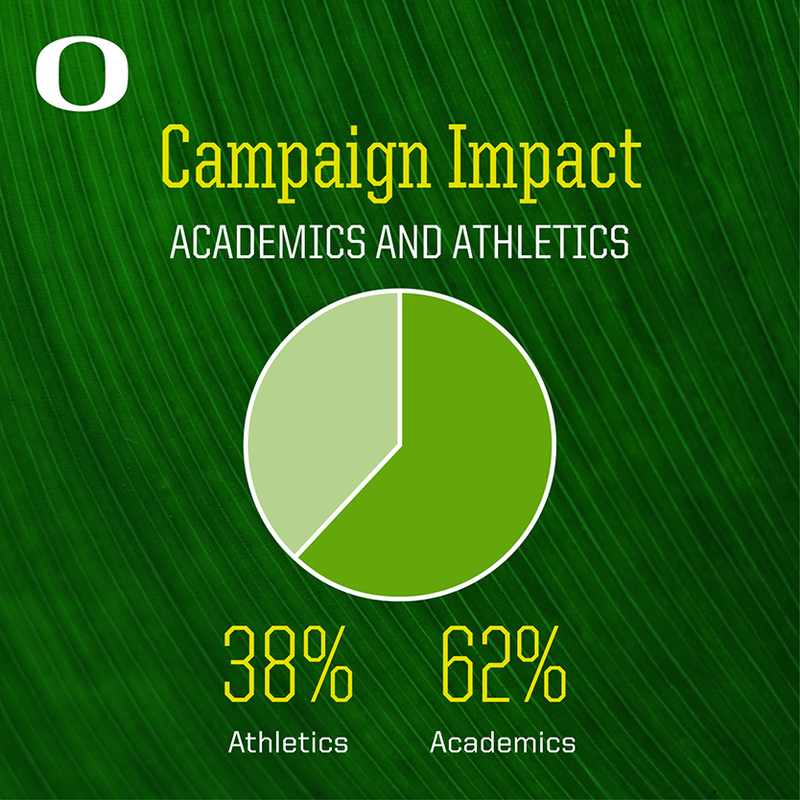 Overall, donors designated more than 62 percent of the total amount raised so far during the campaign for academic purposes. In fiscal 2016, donors tagged more than 80 percent, or about $162 million, for academics. To date, the university has received 312,698 gifts and pledges during the campaign, and 210 supporters have made gifts totaling more than $1 million. In one 24-hour period during the UO’s first annual giving day event — #DucksGive 2016 — 1,350 online donors provided a $1.8 million boost to the campaign. 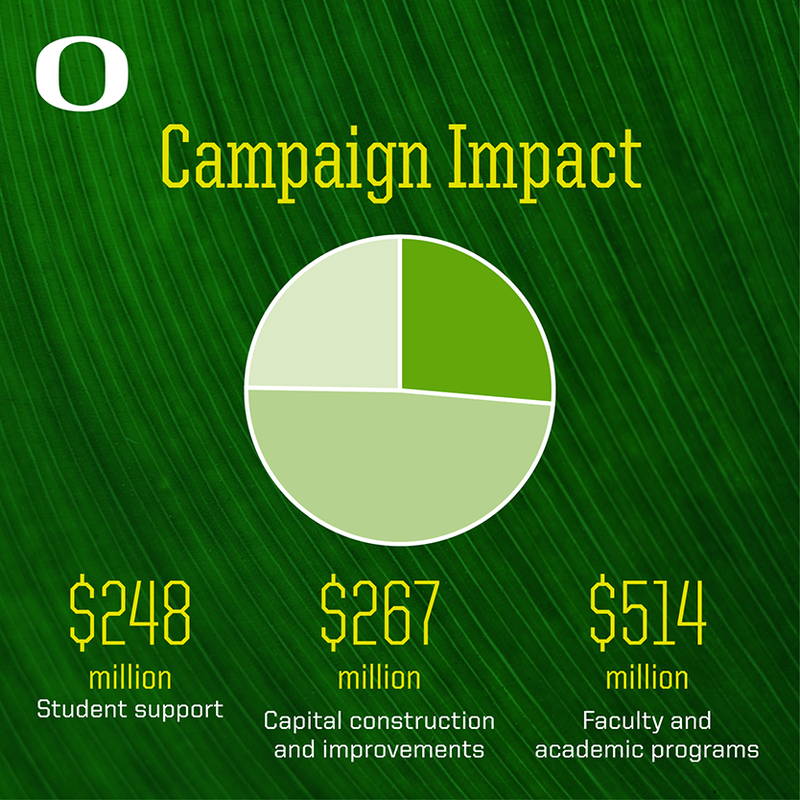 A key objective of the campaign is to gain control over the UO’s financial destiny by building its endowment to a size that will sustain student access, nurture faculty excellence and help fund state-of-the-art facilities. Through strong donor support and market appreciation, the endowment, managed by the UO Foundation, has grown by $344 million since the start of the campaign and is now $753 million. What makes fundraising for the UO so special, according to Mike Andreasen, vice president for advancement, is that donors are helping the UO achieve national prominence in several areas, which is uncommon for universities — especially those without medical or engineering schools — in smaller states like Oregon. As the focus shifts to raising another billion dollars, Schill is eager to play matchmaker between donors and priorities that still await funding.